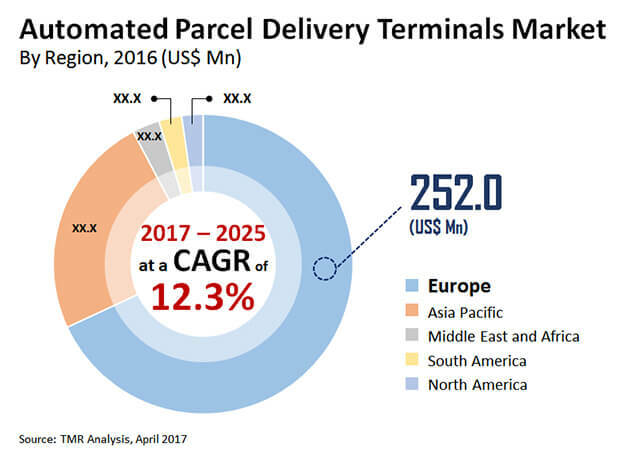 The global market for automated parcel delivery terminal market is currently dominated by a handful of mammoth-sized players. These market players have had a history of successive growth and development, and this is the primary reason behind their strongholds in the market. In the past few decades, none of the companies or firms has been able to challenge the strong position of the players who currently lead the market. However, it is anticipated that the streak of dominance of these players in on the verge of termination as new players ready themselves to enter the market. The competitive landscape of the global market for automated parcel delivery terminals is expected to undergo a transition from being a highly consolidated one to a more fragmented distribution of market share. The leading market players are bound to counter the efforts of the new entrants to establish themselves in the market. These counter efforts could be in the form of strategic alliances, acquisitions, or even extensive marketing. On the other hand, the new entrants are projected to bank on their ability to manufacture innovative and advanced products in the market. The success of the new entrants in the global market for automated parcel delivery terminals largely hinges on a consistent supply chain and progressive growth of their consumer base. Some of the key players that currently operate in the global automated parcel delivery terminal market are Bell and Howell, LLC., ByBox Holdings Ltd., Neopost group, TZ Ltd., ENGY Company, and Winnsen Industry Co., Ltd.
Transparency Market Research (TMR) finds that the global automated parcel delivery terminal market would expand at a CAGR of 12.3% over the period between 2017 and 2025. Furthermore, the global market is expected to be valued at US$1.039 bn by 2025, escalating from a value of US$335.0 bn in 2015. The global market for automated parcel delivery terminal has been expanding on account of the rising number of online orders for several items. Furthermore, the development of advanced distribution channels and swift modes of delivery have also contributed to the growth of the global market for automated parcel delivery terminal. Furthermore, the high volumes of cross-border or cross-country parcels have also created a regular flow of demand within the global market for automated parcel delivery terminals. The government has been steadfast in installing these terminals at several key areas in order to make it convenient for people to fetch their parcels. Hence, the overall demand within the global market for automated parcel delivery terminal is expected to reach unprecedented levels in the years to come. The low-cost and convenience of indoor terminals has led to an increased demand of these terminals as against outdoor terminals. Furthermore, the security risk associated the outdoor terminals has also brought indoor terminals under the spotlight of attention. Several logistics companies, retailers, postal departments, and governments prefer indoor terminals for the delivery of their parcels. However, the risk of vandalism and burglary exists in the case of indoor terminals too, and this could hamper overall market growth. The review is based on TMR’s report titled “Automated Parcel Delivery Terminals Market (Deployment Type - Indoor Terminals and Outdoor Terminals; Ownership - Retailers, Shipping/Logistic Companies, and Government Organization) - Global Industry Analysis, Size, Share, Growth, Trends and Forecast 2017 – 2025”.